Sebastian Vettel led Mark Webber to take a Red Bull one-two ahead of McLaren's Jenson Button at the Belgian Grand Prix at Spa-Francorchamps. Fernando Alonso battled Vettel for the lead but Ferrari's plan to use one fewer set of tyres backfired. Button staged an impressive comeback from 13th on the grid to pass Alonso for third with two laps to go. Lewis Hamilton's title hopes are all but over after he collided with Sauber's Kamui Kobayashi. Vettel now leads Webber by 92 points in the championship with only 175 still available. Alonso moves up to third in the championship, 10 points behind Webber, with Button moving up to fourth, 12 points behind Alonso and three points ahead of Hamilton. Vettel's victory was his seventh in 12 races, and ends a run of three grands prix without a win. Red Bull overcame concerns about their tyre wear by applying and exploited their car's superior pace to leave their rivals trailing. "We had a lot of concerns going into the race after qualifying and weren't quite sure about the tyres blistering," said Vettel after claiming his first victory in Spa. "The team took the risk and we had reason to be confident, but you never know until you get out there. "We both stopped early on so the main target was to see how the tyres were over the first few laps. But the pace was steady and I was feeling comfortable and got back into the lead. "After the safety car it was key to get past Alonso and get a gap to make it more comfortable. It was certainly more tyre management than usual." Vettel went to the grid on blistered tyres and when he stopped for a fresh set as early as lap five, he looked to be in trouble. Alonso, who stopped three laps later, was closing at a second a lap when the safety car was deployed following Hamilton's crash on lap 13. Red Bull called Vettel in for fresh tyres and he rejoined in the queue behind Alonso and Webber but on much fresher tyres. 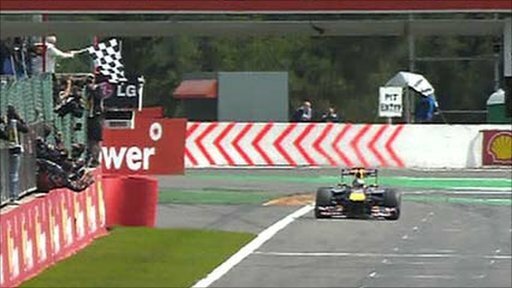 And when the race re-started Vettel exploited his superior grip to race into a lead he was never to lose. Ferrari waited, hoping that Red Bull's tyre problems would mean Vettel would still need to make an extra stop compared to Alonso. But the Red Bull was just too fast for Alonso, who lost a few 10ths of a second through his second stint and even more once the two men had changed to the harder of the two tyres in the second half of the race. "The choice was good for us and opened the possibility to win the race," Alonso said. "But Vettel only lost one place to Webber and at the restart overtook Webber in Turn One so not much traffic. "So I think the decision was good but other factors around the safety car were quite fortunate for Sebastian. "We can do more laps than them but we are slower from beginning to end of the stint because they have a pace advantage of one second per lap, maybe towards the end of the race even more, 1.5 seconds. "It was a fun race and I had a good battle with Mark [Webber] - it is always a special battle at Eau Rouge. "But with every race it is getting more and more difficult to close gap on the Red Bull." Webber was also left to reflect on what might have been after revealing that a problem with his pit-to-car radio had cost him the chance to fight with Vettel for the victory. "I was meant to stop under the safety car but we had a radio problem," the Australian, who signed a new deal to stay at Red Bull in 2012, explained. "I kept asking 'do you want me to stop' and heard nothing. I could have had a fight with Seb through the middle of the race. I don't know how it would have rolled out, it was probably the best way to do it. I'll have to look at it." Chief technical officer Adrian Newey said they asked Webber to come in but he did not hear the message. Button pulled off a number of superb overtaking moves as he moved through the field, using the unusual strategy of fitting the harder tyres at his first stop and then coming back in during the safety car period so he could run to the end on the softer tyres. The 2009 world champion's performance was even more impressive as he revealed after the race that the rear wing endplate of his car was damaged. Hamilton's retirement came as he tried to pass Kobayashi for fourth place. He was on the inside heading into the Les Combes chicane, but appeared not to realise Kobayashi was still on his outside and the two collided even before the braking zone. Hamilton appeared to move slightly left to take the racing line into the corner, but there was also the suggestion that Kobayashi may have moved slightly to the right at the same time. 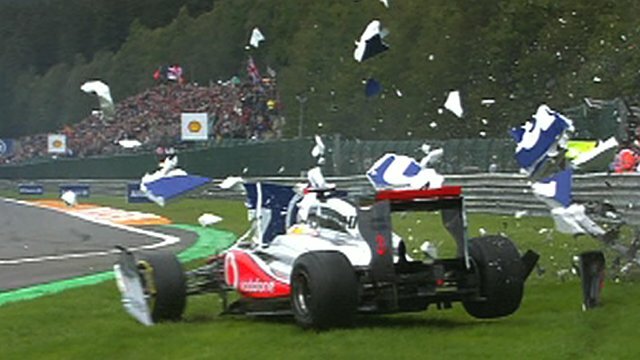 BBC 5 live analyst Anthony Davidson said: "It was a risky move but a racing incident, I'm afraid. "I don't think Lewis expected Kobayashi to be on the outside of him but there is no reason why Kobayashi shouldn't have been there as Lewis had blocked his inside." Hamilton said: "I'm not really quite sure what happened - I hit the wall pretty hard. "As far as I was concerned I was ahead of whoever I was racing and then I was hit by them. I think we were struggling, we were massively slow on the straights, I guess that's why we were in that position. 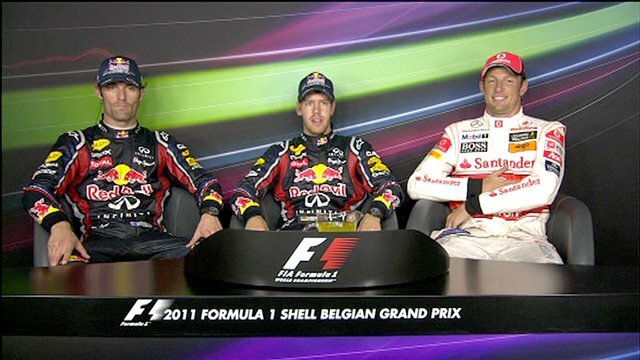 But we might at least have got a podium." Michael Schumacher took fifth on the 20th anniversary of his F1 debut, recovering strongly from the back of the grid and one place ahead of team-mate Nico Rosberg, who led the race early on after a superb start. 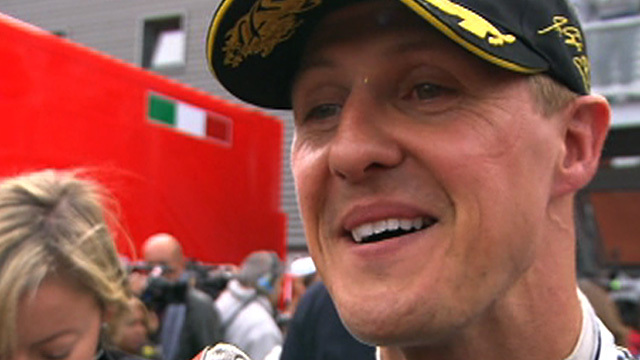 "This is a special weekend for me," said Schumacher. "And although it wasn't too good yesterday, luckily it finished well. I had a good feeling earlier in the day my wife is here and she said it would be a good race." Force India's Adrian Sutil, Ferrari's Felipe Massa, Renault's Vitaly Petrov and Williams's Pastor Maldonado took the final points positions.